As autumn begins in earnest, I can’t help focusing some light on my excellent adventures during the summer of 2013. In case, dear reader, you have not seen this exceptional photo, here’s the story of my Fascinator Hat! 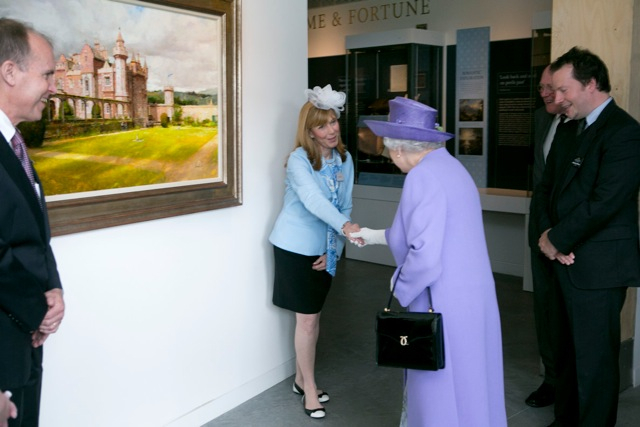 When I first purchased my Fascinator Hat, I thought I’d only wear it one time at Abbotsford during the Royal opening of the New Visitor’s center. I wanted to dress appropriately to meet one of the Royal VIP’s, but I never imagined I’d be presented to Her Majesty Queen Elizabeth II as Richard Schmid’s emissary! For more on the subject, scroll down to read, Excerpt from Jeffrey Carlson – Contributing Editor, Fine Art Today. Needless to say, it was a once in a life -time event! 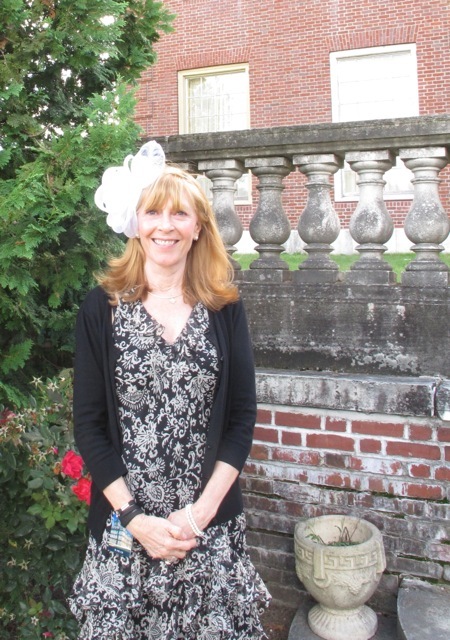 However, I did have the opportunity to wear “The Fascinator Hat” again during a Downton Abby inspired Garden Party at Elm Bank, the home of the Massachusetts Horticultural Society in Wellesley, Massachusetts during the last weekend of summer. I’m really proud to be a member of this great society, beautifully run by a dedicated group of Master Gardeners who organized this fundraiser to assist the Garden to Table Program. Grow Your Own Food-Start with a seed. End with a meal. The Massachusetts Horticultural Society’s Garden to Table Program offers the Public an opportunity to come together in a beautiful and welcoming setting to learn about growing, cooking, and preserving healthy food. Mass Hort. is uniquely situated to help in this effort. Since 1829, Mass Hort. 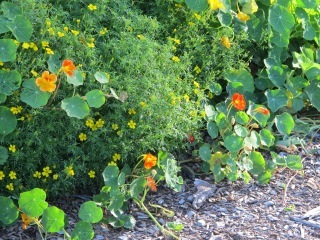 has been a leader in learning and teaching about horticulture. With their Garden to Table program, they’re offering their knowledge of plants to enhance the well-being of the community. They also support Food Pantries by growing food that is donated to the Wellesley and Natick Food Pantries. Last year, their gardens produced nearly 4,000 pounds of produce to help families in need. They also recently embarked on an exciting partnership with the Tufts University Jean Mayer USDA Human Nutrition Research Center on Aging. They created an organic garden in the sun-filled lobby, and are donating the vegetables grown there to the Greater Boston Food Bank. Visit: http://www.masshort.org/Garden-to-Table-Program. 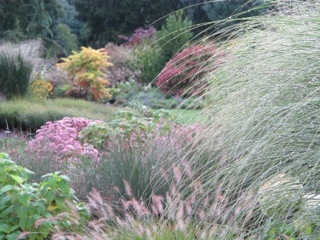 Here are a few shots I took during a recent Photography class at Elm Bank’s exquisite gardens. Alla Prima II and The Landscapes book will also be available for sale. The Small Treasures Show is really a celebration of beauty, joy and friendship. The Opening reception is on Saturday, November 31 in Boston, MA from 3-5 pm. My friend Bill Craig, owner of Haley and Steele and my company, West Wind Fine Art are joining together to usher in the Autumn season of Thanksgiving and will present small paintings and sculpture by the artists I represent as well as the artists in his gallery which is located on the 2nd floor at 162 Newbury, one of Boston’s most historic and fashionable streets. 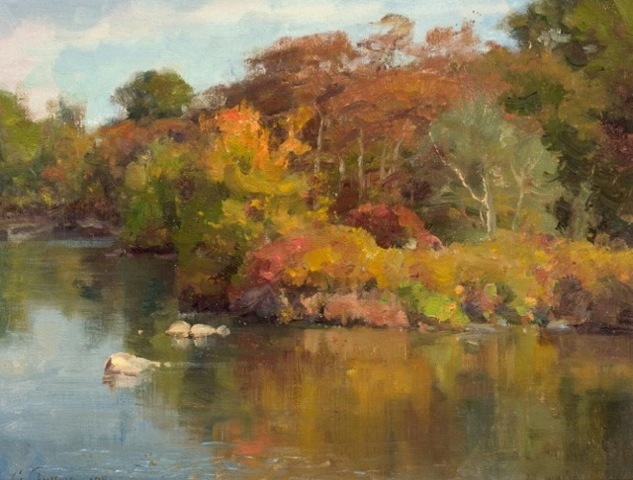 I’ve curated a wonderful selection of small paintings by Clyde Aspevig, like his plein air 11” x 14” Oil titled, “Mary’s Lake- Naushon Island” just off the southern coast of Cape Cod. in a 22 karat gold leaf frame from Guido Frames. West Wind Fine Art will also feature paintings by Carol Guzman, Daniel J. Keys, Judy Stach and guest artists, Kathy Anderson, Stephanie Birdsall, Ryan Mellody and Douglas Reichwein. Then on Sunday, December 1st, I’m excited to announce the Premier of Daniel J. Keys new instructional DVD at Regis College in Weston, Massachusetts from 1-3 pm. $115 includes a signed and numbered limited archival print by Daniel J. Keys. 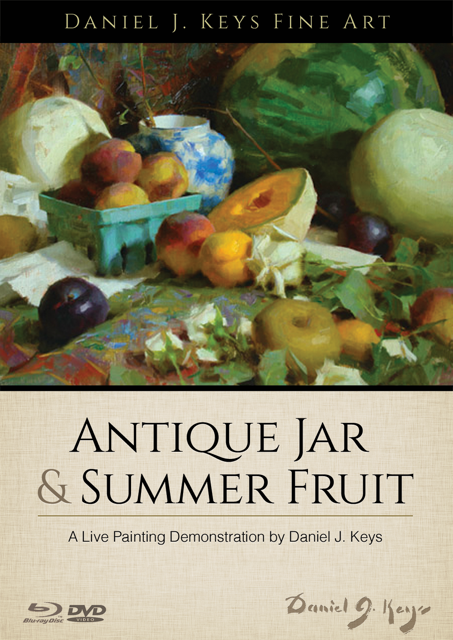 Daniel gave a live still life demonstration last June during the three -day celebration of Art hosted by myself, and West Wind Fine Art at Regis College’s center Foyer. Ryan Mellody, creative director of the wonderful on line magazine, www.artistsonart.com filmed Daniel Key’s painting demo. And together, the three of us, are producing this brand new DVD that includes an introduction and twelve-page catalog of Daniel’s paintings. Please Save the Date for the Premier of Daniel Keys’ new DVD! Sunday, December 1, 2013 from 1-3 pm at Regis College, 235 Wellesley Street, Weston, MA. College Hall Grand Foyer- Parking is available. 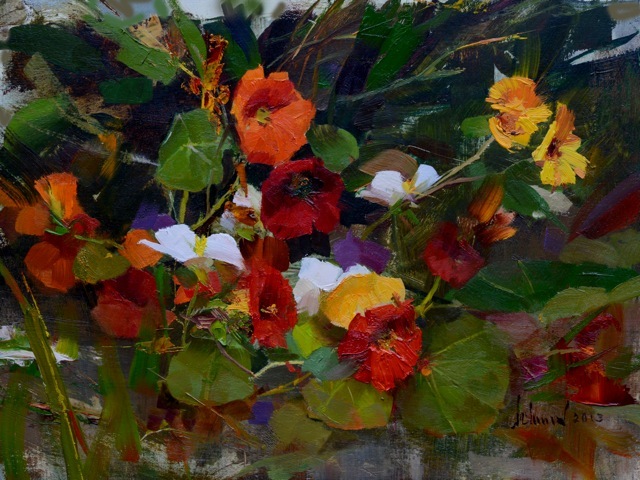 In addition, larger paintings by Daniel Keys, Richard Schmid, Nancy Guzik and Clyde Aspevig will be on view. 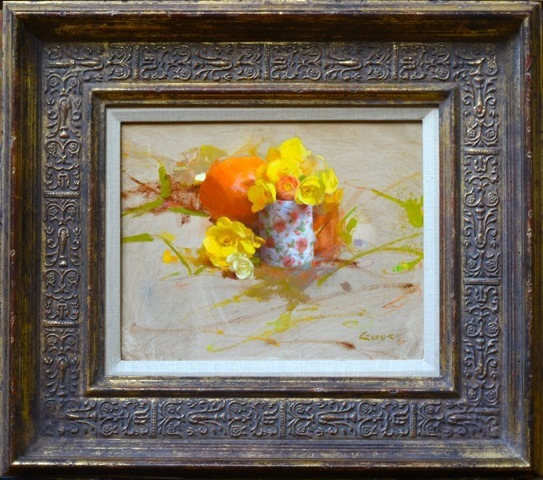 West Wind Fine Art will donate a portion of the sales to the Regis College’s scholarship fund. 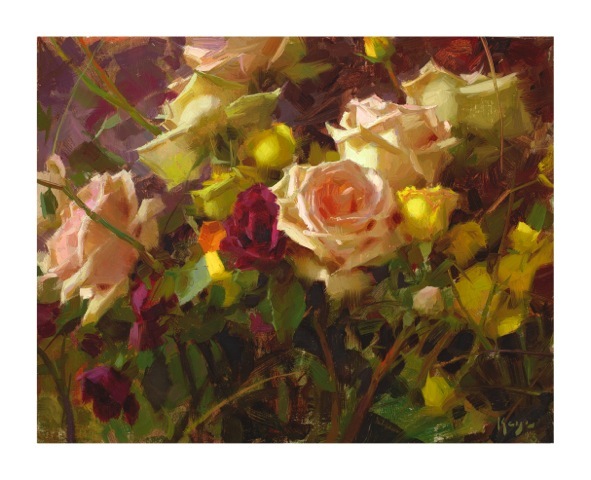 We’ll also be raffling one of Dan’s framed prints, “Unfolding Petals” to benefit Regis College’s scholarship fund.